Marjorie Louise Rawson, 98, died at home in Nampa, Idaho on Sunday, January 13, 2019. 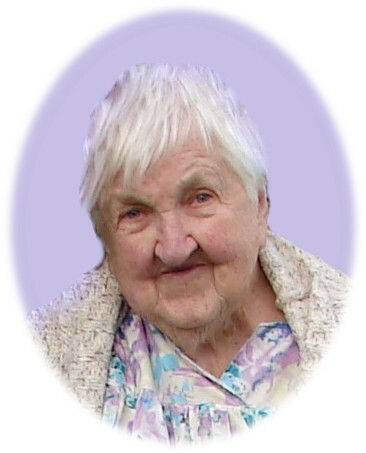 She was born the second of ten children on October 18, 1920 in Carey, Idaho to Orville Lynn and Llewellyn Harris Loosli. On August 8, 1940, she married Wilber Francis Rawson in St. Anthony, Idaho. All six of her children were born here. She moved to Pocatello, Idaho around 1955, where she remained until moving to Nampa, Idaho in 2002 to live with a daughter. She was preceded in death by her husband; a son, Louis Rawson; a grandson, Trever Rawson; and seven of her siblings. She is survived by two sisters, Athalie Gravatt and Martha (Athel) Mallory; five children, Francis Rawson, Theo (Mercedes) Rawson all of Pocatello, Lilas (Micheal) Talley of Twin Falls, Dale (Chris) Rawson, and Jeanie (Allen) Thor all of Nampa; 16 grandchildren; 42 great-grandchildren; and 8 great-great-grandchildren. Services will be held at 1:00PM on Thursday, January 17, 2019 in the Church of Jesus Christ of Latter-day Saints Chapel (3904 E. Greenhurst, Nampa, Idaho). A view will preceded the service from 12:00 noon – 12:45PM. Burial will be in the Parker, Idaho cemetery on Friday, January 18, 2019 at 3:00PM. Services are under the direction and care of Alsip and Persons Funeral Chapel (404 10th Avenue South, Nampa, Idaho).